4K video recording hasn't been the exclusiveness of professional 4K camcorders since the day that iPhone 6s and iPhone SE support 4K video recording. We ordinary iPhone users can use our iPhone 6s or iPhone SE to record 4K video at 30fps. Things become even better when the successors iPhone 8/Plus and iPhone X are released, for they enable you to record 4K Ultra HD video at 30FPS or even 60FPS with two codecs H264/HEVC to choose from. Thus, you can save almost 50% storage space if you select HEVC video codec on iOS 11 device to record 4K video. That being said, dozens of users are still bothered by the large-sized 4K video file size (4 times the pixels of 1080p) and they feel an urgent need to know the detailed file size of 1 minute or 1 hour of recording 4K ultra HD at 30FPS/60FPS on iPhone. Thus, they can easily handle the 4K video duration when recording based on the storage capability of his/her device. To address your needs, the below part will clearly show you how much space it'll take up based on the 4K video length, video codec (H264/H265) and frame rate you adopt. 1 minute of 4K at 24FPS will takep up 270MB for H264 and 135MB for HEVC/H265. 1 minute of 4K at 30FPS will take up about 350MB for H264 and 175MB for HEVC. 1 minute of 4K at 60FPS will take up approximately 400MB for HEVC. Note: 1. to save iPhone space, generally Apple won't allow you to record 4K 60FPS video on iPhone unless you turn on and use HEVC codec for 4K recording. 2. Once you upgrade your iOS 10 to iOS 11 on iPhone 7/7 Plus, the 4K video recording will be automatically running at HEVC codec to save space up to 50%. 1 Hour of 4K at 24FPS takes up around 15.8GB for H264 and 7.9GB for HEVC/H265. 1 Hour of 4K at 30FPS consumes about 20.5GB for H264 and 10.3GB for HEVC. 1 Hour of 4K at 60FPS hogs up space approximately 23.4GB for HEVC. Now, based on your iPhone space capability, you know how long of the 4K video your iPhone can store without eating up all your iPhone space. If you're not sure about the frame rate your iPhone 4K recording supports, check the following part with specific iPhone model, 4K video frame rate and maximum 4K video length. iPhone 8/Plus/X (64GB): about 8 hours in HEVC. iPhone 8/Plus/X (256GB): about 32 hours in HEVC. iPhone 6s/6s Plus: about 30 mins in H264 codec for 16GB version; 1 hour for 32GB; 2 hours for 64GB; 5 hours for 128GB. Note: iPhone 6s/6s Plus only supports 4K video recording in H264 codec, HEVC unsupported. iPhone 7/7 Plus: about 2 hours in HEVC for 32GB version; 10 hours for 128GB; 20-22 hours for 256GB. iPhone 8/8 Plus/X: about 4 hours in HEVC for 64GB; 20-22 hours for 256GB. iPhone 8/8 Plus/X: 1.5 hours in HEVC for 64GB; 7-8 hours for 256GB. Compared with 1080p or 720p, 4K Ultra HD video is really space-hogging, which can instantly eat up your iPhone free space as you can see from the above list. If your iPhone has enough space like 256GB, then you can save about 20-hour 4K video at 30FPS. What if your iPhone only has 32GB or 64GB space in total? You'd better to compress 4K video to 1080p or reduce 4K video file size if you don't wanna take forever to upload 4K video to YouTube or directly delete large-sized 4K video to free up space. And to compress 4K video file size, there are several ways to reach this goal. No matter which way to go, the primary condition is to find a solid 4K video processing software. The world's No.1 fast 4K video converter - MacX Video Converter Pro is the very one you need. Built-in with 370+ video/audio codecs, this 4K video processing software enables you to convert and process 4K Ultra HD video from H264 to HEVC codec to reduce 4K video size with 50% compression ratio. Thus, you can upload 4K video to YouTube in HEVC 2X faster than before. Of course, it also supports you to decode and encode 4K video from HEVC to H264, MPEG-4 AVC, MP4, MOV, AVI, MKV, etc. for playback on more devices, players and platforms. Compress 4K Ultra HD video to 1080p Full HD, alongside with 4K 60fps to 4K 30fps change, to reduce 4K video size so as to save 4K video on your iPhone (16/32/64GB) with around 4 times smaller space consumption. Of course, the whole 4K compression is lossy in quality. But don't worry. MacX constantly optimizes its High Quality Engine, Auto Copy mode and video processing kernel to produce highest possible quality, up to 90% - 98% quality reserved. As the world's unique 4K video converter with Intel/Nvidia/AMD GPU hardware acceleration tech supported, MacX can provide you 5-8X real time faster speed to accomplish 4K video converting, 4K video compressing and 4K video editing (trim/crop) tasks, up to 250-320 FPS. How to Reduce Large-sized iPhone 4K Video? Free download this fastest 4K Ultra HD video processing tool on Mac or Windows. Then open and run it on your computer. Tap "Videos" button to load the iPhone 4K video files. Or just drag and drop 4K files into this No.1 fast 4K Ultra HD video converter. Note: you need to transfer 4K video from iPhone to Mac or Windows computer first. Use iPhoto, Photos, Image Capture or iPhone transfer tool to make it happen. Select the output video format on the pop-up window. 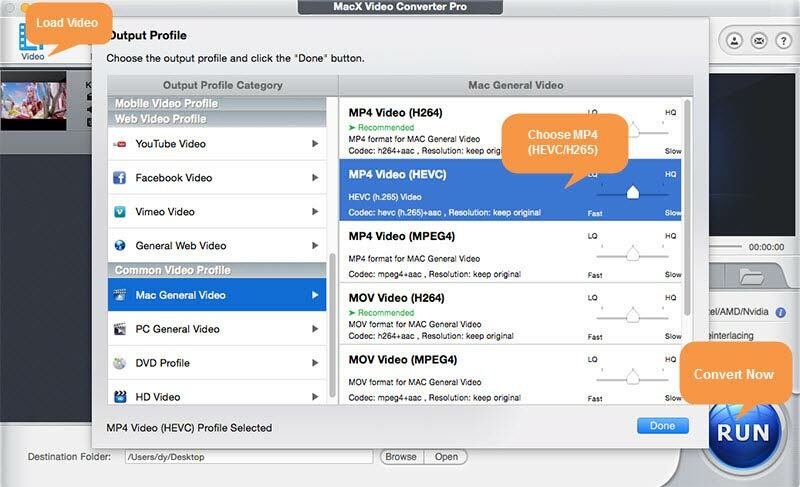 You can choose MP4 video (HEVC) or 4K MP4 (H264) from "Mac General Video" profile. You're suggested to choose "MP4 HEVC" as output format if you wanna save 4K video on your iPhone with smaller space occupied. Of course, it's also a nice choice to choose 4K MP4 (H264), for it has better compatibility than HEVC to be uploadable to YouTube/FB/Vimeo, playable with 4K video player/4K TV and other mobile devices. 1. Tap settings icon to enter the parameter settings window, where you can compress 4K 2016p to 1080p resolution and change 4K 60fps to 30fps or 30fps to 60fps at your willing. 2. Find and click the scissor-shaped icon "Edit" and then you'll be re-directed to the video editing zone, where you're able to use "trim" feature to shorten 4K video length and utilize "crop" feature to remove 4K video image border to further shrink 4K video size. The 4K Ultra HD video processing is a compute-intensive task for the ordinary Ultra HD video converter, for the common tools rely on software decoding and encoding to deal with 4K video processing. Using MacX is a different story. Armed with the advanced Intel QSV/Nvidia/AMD CPU & GPU hardware encoding techs, MacX can make full use of your computer high configurations to hardware decode and encode 4K 30/60fps video at 5-8X faster speed. You can see the hardware encoder will be auto ticked if your computer supports them. Then, leave the rest to this software and your hardware to process 4K at world's No.1 fast speed, up to 250-320FPS. Hit "RUN" button and it will begin to edit, convert and compress 4K Ultra HD video at GPU hardware accelerated speed, along with mutli-core CPU (up to 8) and hyper-threading tech. The output 4K video will automatically open after the conversion is over. Just a few minutes later, you can get your desired 4K video file and then fast upload 4K to YouTube, play 4K on TV, E-mail 4K to friends or just save 4K on your iPhone. Free download world's fastest 4K video converter to transcode 4K Ultra HD video to H265/H264 with 98% quality reserved. It also allows you to compress 4K 2160p to 1080p and change 4K 60fps to 30fps or vice versa to reach your goal. More importantly, the whole 4K video processing can be finished at 5X faster speed, all thanks to the powerful Intel QSV/Nvidia (CUDA/NVENC/NVDEC)/AMD hardware acceleration tech supports. The complete explaination of what 4K UHD video is. Download 4K editor to trim, crop, add subtitles, rotate 4K video. Check to see the difference between 4K and 1080p. Try free video resolution converter to change video resolution.